There is one factor that many gun owners do not think too much about when they are choosing the best gun safe for their needs, and that is if their gun safe is fireproof or not. The fact is, there are so many gun safes out there that are not fireproof. There are even gun safe manufacturers that claim that their product is fireproof when, in reality, they make their own un-regulated fire ratings. Therefore, it is extremely important, if you’re looking for a fireproof gun safe, that you end up buying a gun safe that was thoroughly tested against fire exposure. It’s important to investigate the construction and how thick the wall is in order to determine how fireproof a safe is. It goes without saying that the most important factor of a safe is its quality construction. The reason is, that inadequately constructed safe won’t keep your guns protected from fire (or burglars). Therefore, the thickness of its wall is what makes a good safe. Thick walls (8 gauge steel or thicker) will offer much more protection against fire, flood or thieve than a safe with thinner steel construction. In order to determine if your desired gun safe is thick enough, you need to look into its true thickness. What you should do is to look into the steel gauge and not the thickness written in the description. Maybe the description states that the safe is 2″ thick, when in reality, most of the thickness is just made-up of drywall. Thickness means everything when we are analyzing security. 3 What Should You Understand About Fireproof Ratings? 4 Why Do You Own a Fireproof Gun Safe? Here we have an outstanding fireproof safe for small guns like pistols. It features a backlight keypad for quick access without having to turn on the lights late at nights. In case you are unable to open the safe because you forgot the access code, you can access it using either of the 2 master keys. 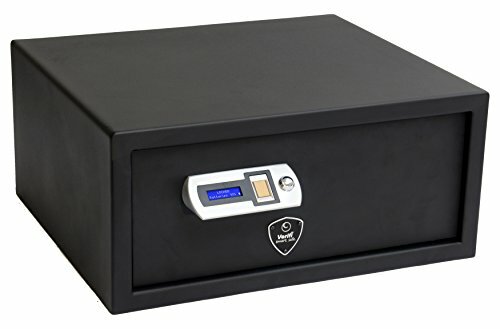 This one is among the top-quality fire resistant gun safes that will hold your belongings safely stored for about an hour when exposed to fire (UL Classified). In case of fire, the inside temperature will stay at 350°F. What makes this safe extremely reliable is that the door is completely sealed around the area where the door is located. This coating will prevent any fire and water to reach inside the safe and it will protect your valuable items from water damage. Moreover, the safe is guaranteed to be moisture free. 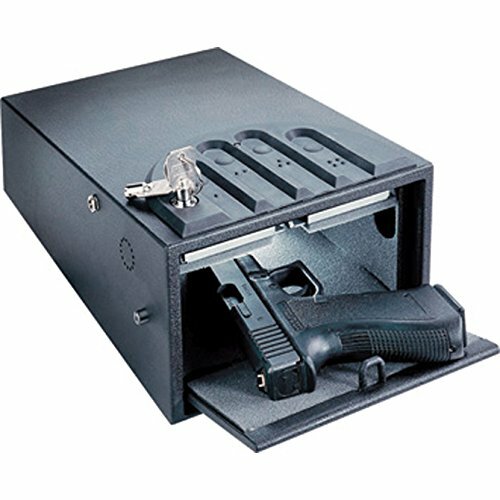 As you can see from the pictures, it’s bigger than many other traditional gun safes in this price range. 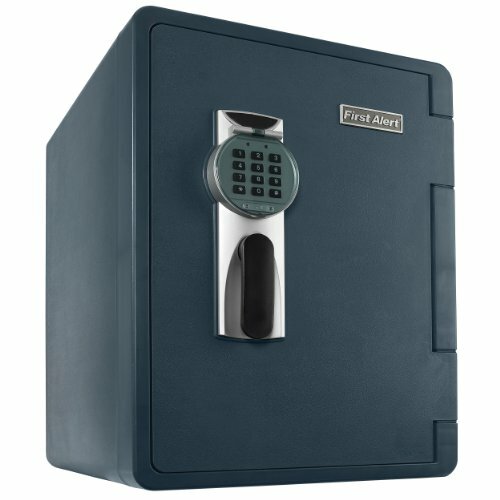 Even though it’s quite budget friendly, it is extremely well built and more effective than many other safes that cost much more. You can store a couple of pistols and additional ammo. 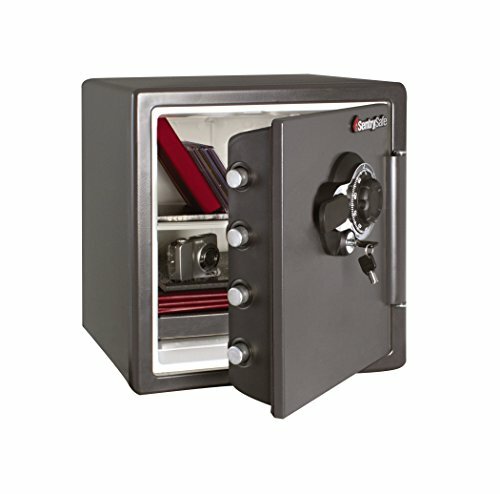 As with any industry-leading company, this safe carries a 5 year warranty. This is longer warranty than many other manufacturers offer, and they will provide you with a replacement item for life if your safe is exposed to fire. If somebody tries to access the safe and enters the code frequently incorrectly, it can’t be open except if you have the master keys. Another convenient feature is that this safe includes 2 shelves that you can adjust to your own needs, or you can remove them for more space. Furthermore, you will enjoy a handy storage space located inside the door to stack up small items. Have in mind though, that this compartment space will not hold much weight. The MesaSafe unit is extremely popular among gun owners. If you are on a tight budget, then this is probably not your best option. This safe has top quality written all over it and in this case, quality also has a price. This is probably among the best-built gun safe that you can get your hands on. At this price, your rifles will be securely stored, and you will enjoy more than enough room for your weapons, ammo and your other valuable belongings. This monster steel construction weighs around 650 lbs, so it will be a real headache for anyone who wants to run away with it. For additional security, it’s easy to bolt the safe down to the floor utilizing the holes that are already pre-drilled. You won’t find many gun safes out there more secure than this one. Not only is it heavy, with the option to bolt-it down (with 1.5″ thick bolts) to the floor, but also the locking mechanism is protected with a steel plate that is impossible to drill through. Moreover, its fire resistant (one hour) upto 1750°F. This safe features a digital locking system, so if someone tries to alter the digital pad, then a manual locker takes-over and ensures the safe will remain locked. Overall, in case you are on the lookout for the very best fireproof safe, I strongly advise you to consider this one. It has plenty of space, beautifully rugged and includes a lifetime warranty so the customer service-team will happily cover any issues you might encounter. If you are looking for a budget-friendly, quality built gun safe, then this safe might be your best option. Although it this safe won’t break your bank, it does not mean that it’s poorly designed. It looks and feels sturdy and provides top security at a very reasonable price, and it will hold many long guns, such as rifles or small guns. It is beautifully designed, extremely effective and nicely rugged interior to protect your weapons from scratches. This safe will provide you with more than enough space to store your weapons. 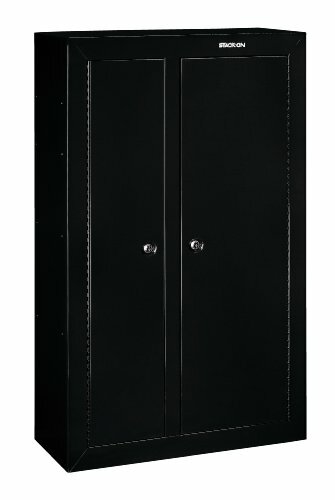 It can store up to 14-guns and contains removable shelves if you prefer to customize the safe to your needs and space. To keep the content safely secured inside, the lock mechanism is straightforward and efficient. The locking system unlocks as soon as you turn the turning-wheel to draw back three big bolts. There is no biometric or electronic system features to deal with here, and therefore, this one might be perfect for those of you who are not much into technology. The Stack on 14 is fireproof rated and is tested to hold up against fire for about 30min. However, take into account that if you are looking for a waterproof safe, this is not the gun safe that fits your style and needs. The first item on the list is a gun safe that contains several exceptional elements you can count on in order to safely protect everything inside the safe. This is a spacious gun safe that can store up to 22 fire-arms or you have the option to store 8-9 guns and leave plenty of space for your other valuable things. The interior is beautifully covered with carpeting material, so there will be no scratches or dings on your guns if you need to move them around the safe. This safe features electronic locking mechanism that will warn you if the access code is not correctly entered. It is close to impossible to crack this safe open or drill through this safe as features 2-way locking mechanism. Moreover, it features 6-locking pins, enhancing the security even further. To boost the security even more, you’ll discover steel hinges, located on both sides along with sturdy bolts. The digital keypad runs on batteries and you will get batteries with your purchase. In case the batteries dry-out, you will always have access to the safe either by using any of the two back-up keys that you receive with your purchase. You don’t have to worry about ending up one day with empty batteries, because the safe will alert you when the batteries are running low. 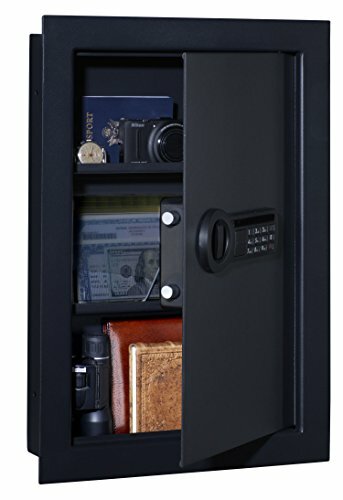 If you run into any troubles with the safe, then you are backed up by the industry leading 3-year warranty. Overall, the Stack-On is pretty big, as it measures 16.6″x55.1″x26.8″ and weighs around 247 pounds. It offers numerous security measures such as 6 locking points and deadbolts so it will be hard to drill or crack-up the safe. In addition, it is extremely spacious, and you can customize it to suit your needs by removing the shelves for more space. If you happen to live in an area where you can expect wildfire or even flood, then I strongly suggest that you consider this brilliant fireproof gun safe. Although many gun safes out there are advertised as fireproof, this one features advanced and sophisticated fire-protection. It’s bound to safely protect every one of your belongings in temperature ranges as high as 1700 Fahrenheit (927 Celsius) for up to 1 hour. It’ll likewise, prevent your important documents, CD’s, DVD’s and your weapons from melting. The great thing about this gun safe is that it will protect your belongings for any water damage as well. That is to say, this unit can resist 24 hours beneath 8” of water. You won’t need any batteries to access this safe because of the combination locking feature. You’ll need both things (combination and keys) to access the safe. That way, nobody else than you can open the safe if they don’t have both things. It is highly unlikely that a burglar will succeed in opening up this safe if it’s locked. It includes 4 big bolts, and also it includes a hinge bar to make it close to impossible for any thief to gain access to the safe. What makes this safe popular among gun owners is the quality of the construction. It is built with very thick walls that will provide more protection if it is exposed to fire. Moreover, it includes bolts for you to securely bolt-it down to make it even harder for an intruder to run away with the safe. More features that current owners are thrilled to enjoy are the adjustable shelves that make any rearrangement dead easy if you need more space. However, even with the shelf inside, there is plenty of space. The SentrySafe customer service team will gladly assist you if you get into any trouble with the safe as they provide you with an insurance coverage if your belongings get damaged in fire. It is worth mentioning, however, that the warranty does not cover any moisture damages. What that means is that this unit is constructed with heat retaining material that makes it fireproof, and this insulation will create a tiny bit of moisture. The warranty does not cover any moisture damage. Therefore, it is advisable that you avoid storing anything inside your safe that cannot handle moisture. Next item on the list is the Stack-On FS-24. 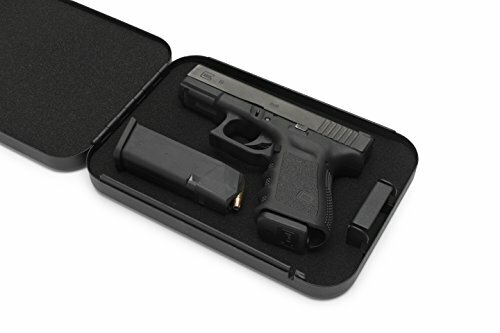 This unit has more than enough room to store your firearms and other valuable items. It is able to take 24 firearms. What’s more, it has 4-adjustable shelves that are intended for smaller valuables that you would like to securely store inside a safe. It is beautifully rugged on the inside to protect your guns from any scratches and dings. In addition, it features a combination lock using 3-digits that is located at the front. It’s a known fact that anyone who drills through locking mechanism will gain access to the safe. However, with this safe, it is close to impossible to drill through lock because, inside there is a massive steel plate is located at the rear of the lock. Its fireproof upto the 30min mark, in temperature of around 1400 °F. Moreover, it includes a limited life-time guarantee plus a limited 5-year warranty. Current owners are very happy with the 4-adjustable shelves that can be used to store smaller items such as ammos. Furthermore, this unit is around 500 pounds, making it a real headache for an intruder to walk away with the safe. What makes this safe among the top rated fireproof gun safe, is how the seal is constructed around the door. In case of fire, the seal will expand and no heat will reach into the safe. The only drawback is that it’s not water safe. Therefore, you should not store anything that can’t resist water. 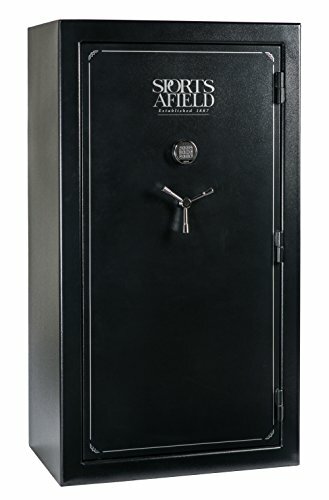 Next on our list is an electronic/digital lock gun safe that includes 9x 1″ steel locking bolts, 6x live action bolts and 3x inactive bolts located on the side. Apart from that, it also features a spring-loaded re-locking bolt. This security bolt will kick-in if anyone tries to alter the lock or drill through the lock with the intention of removing it for ease access to the safe. The interior is completely padded in grey in order to ensure that you won’t scratch your firearms. 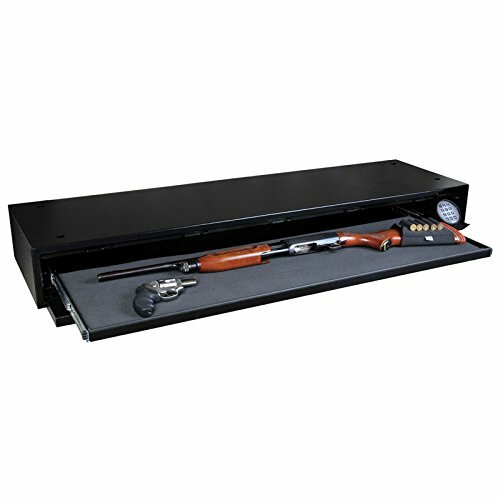 This safe contains 4 adjustable racks that you can remove if you want to store your up to 10 guns on each side of the safe. In addition, it has a fixed fully wide shelf, located at the top. It is extremely spacious, and it has a max capacity of 20 long guns. This of course depends on what type of guns/rifles/shotguns you have. You can expect storage space of around 14-16 rifles, but again, depends on the size of your firearms, and if they have scopes or not. 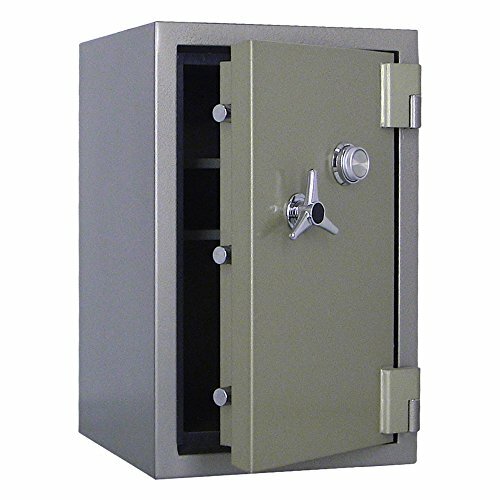 It is constructed of high quality 12 gauge steel with a heavy duty 4.75″ thick door. Furthermore, this unit is fireproof and has a fire rating of 45min at 1550degrees Fahrenheit. Externally, it measures 59 inches high by 28 inches wide by 18 inches deep and weighs 425 pounds. It comes with a free rechargeable silicone gel dehumidifier to protect your guns against moisture and the damaging effects of corrosion and rust. It comes with pre-drilled holes in the bottom for securely mounting to the floor and to run a dehumidifier cord through, if desired. UL RSC Ratings – These are safes are intensively examined against fire exposure by Underwriters Laboratories. This rating indicates how secure the safe is against tampering. UL Fireproof Classification – This type of rating indicates how long the safe is able to safely secure all the contents stored inside below a specific temperature. For example, a rating of “500-1 hour” simply means that the inside will not exceed 500°F for an hour. California Department of Justice (also known as DOJ) – Will provide ratings for drill resistant lock, thickness of steel walls, protection of door hinges and the thickness of steel locking bolts. If your desired safe has any of these ratings, then you can rest assured that your safe is thoroughly tested against fire. These tests are from trusted and regulated intuitions, and the safes are analyzed before receiving the approved fireproof stamp. 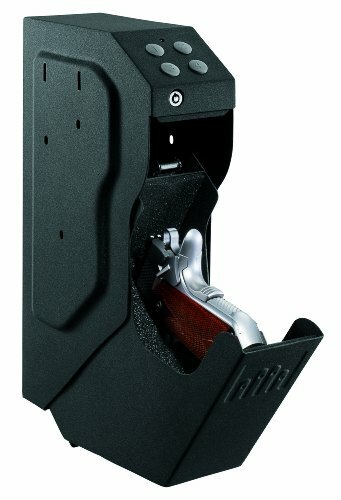 Below you will find many of the best fireproof gun safes that are available. Feel free to browse through the list, and I hope the information will serve you well and you will end up with a budget-friendly gun safe. The fact is, fireproof safes are not cheap but this is something you really should consider. It’s better to think ahead, in case something happens, and invest a little more to securely store your valuables no matter what happens. 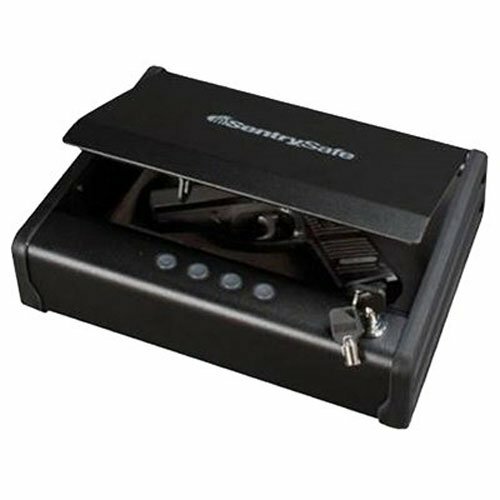 You will find different safes, with different price tags to meet your needs and budget. What Should You Understand About Fireproof Ratings? More and more fireproof safes being sold today do not protect your belongings from a crook just like you you’d wished. There is always the option to invest in another safe and have 2 safes in the house. One to safely store your items that you would want to shield yourself from robbery, and another fire-proof safe that you would use to store everything you need to go through the day. However, there is no point in buying two safes as there are so many safes for sale that are both fire and waterproof. But the question is, how do you know what safes are fire resistant and how do you know for sure that the safe was thoroughly tested? The reality is that the manufacturers can alter the fire-ratings of their products using their own test lab. You should always be on the look-out for safes that are fire regulated by an approved institution. These institutions make extensive tests and thorough research with fire to ensure that the safe actually can withstand exposure to fire. It’s not recommended to store ammo in a fire-proof safe simply because the insides’ belonging might be vulnerable to heat, and if you store ammo and your safe is exposed to fire for a long period of time, it can have serious consequences as the ammo can explode. Therefore, it is recommended that you investigate thoroughly what kind of material was used to construct the safe with, in order to be sure that it will resist fire. As I did mention above, some manufacturers alter the fire rating by constructing some percent of the walls from drywall. That way, the company can make false claims that their product meets the thickness standard for fireproof regulation, when in fact, the majority of the thickness is made of drywall. For that reason, it is important that you only invest in a safe from a reputable company. 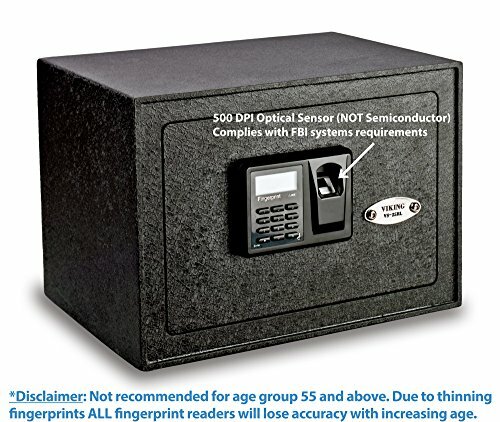 Why Do You Own a Fireproof Gun Safe? You should think long term and if you do, you’ll end up with a gun safe that fits your needs perfectly. Don’t try to save a buck or two and invest in a non-fireproof safe. What if you experience fire in your house? It’s better to pay a little bit more and invest in a fire resistant safe. The great thing about fireproof safe is that you can stack up so many valuable things that you use on daily basis. You can even store some clothes and food inside if you prefer so. It’s likely that you own valuable papers and precious photos that you simply cannot replace. Then a fire-proof safe is your solution. It’s unlikely that you will experience fire, but be on the safe side and go the extra mile with a fireproofed safe. It will pay off in the end. I hope you are able to make your own informed decision about what is the best fireproof gun safe that fits your space and needs. You should decide which safe will meet your budget and demand. Going through the jungle of reviews online can be a daunting task, but I hope I was able to narrow the list down and make it easier for you to choose the right safe. We are all different, with different needs and what fits your space and needs might not suit your neighbor. Therefore, you need to do thorough research before you invest in a safe. 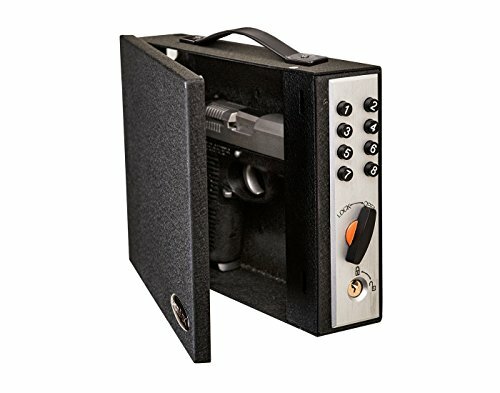 There are so many brands out there with so many different features, but if you do your homework, you’ll end up with a safe that will last you for years to come.